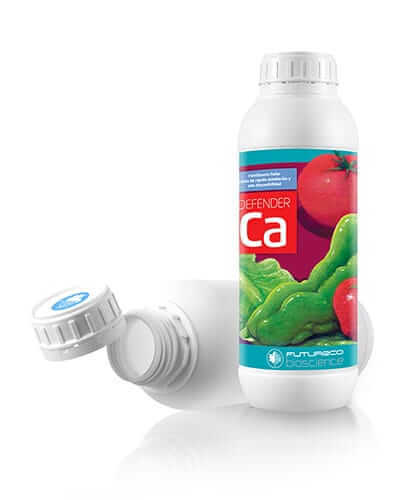 Defender Ca - Kenya Biologics Ltd.
DEFENDER Ca is a liquid formulation of calcium chelated with amino acids to increase absorption and translocation within plant tissue to improve plant vigor. – Role of calcium: Calcium is a key element in all stages of a plant’s life cycle. It is essential for growing, reaching from germination up to ripening of the fruits. Calcium makes vegetal tissues more resistant. – Calcium deficiency: It occurs mainly due to low mobility and causes apical necrosis, bitter-pit, fruit cracking and premature ripening. Applications of DEFENDER Ca prevent and correct calcium deficiencies and provide growth stimulation. DEFENDER Ca can be applied in foliar spraying or diluted in irrigation water. Apply at 2-3 weeks intervals and repeat as needed. Use sufficient water to ensure thorough coverage. DEFENDER Ca is stable for at least three years since manufacturing date. Keep in a cool and ventilated place. DO NOT store for prolonged periods in direct sunlight. Keep away from food, drink and animal feed. Keep out of the reach of children. DO NOT mix with products containing phosphorus. For application with plant protection products follow pesticide label directions and make jar test for compatibility. *Free L-amino acids are obtained from enzymatic hydrolysis of plant proteins.Composition is subject to change according to the local regulations for such products. Apply 1-2 times during vegetative crops and 2-3 after fruit setting. Apply 1-2 times throughout the crop cycle. Apply 2-3 times throughout the crop cycle. Apply at 20 days interval after fruit setting and repeat as needed. Apply 3 times throughout the crop cycle. Apply 1 time at bolls (capsule) setting.